Lautenbachs LOG DEN - AT The 45th Parallel. 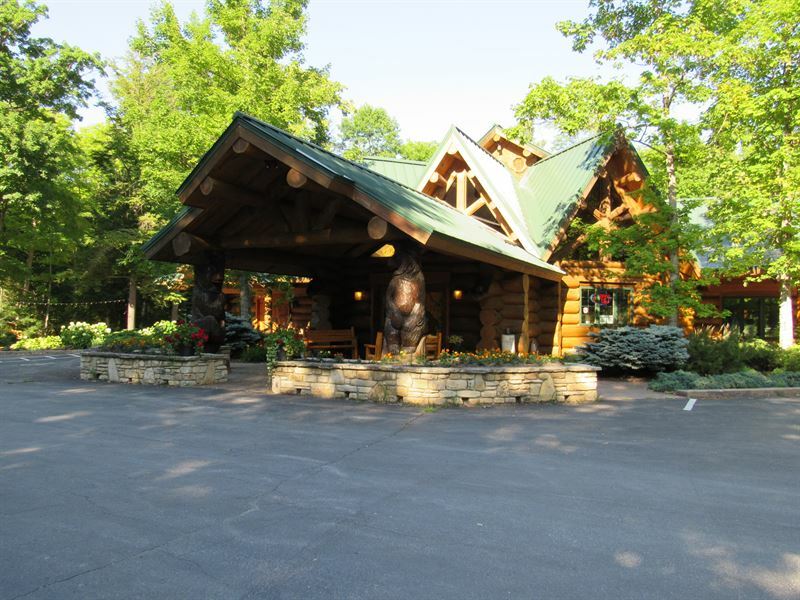 This hand-carved log masterpiece is home to a Great Food and Spirits Restaurant that is located on Highway 42, just south of the Village of Egg Harbor on the famous Door County Peninsula of Wisonsin. Egg Harbor has been named one of the best small towns in America. The natural beauty of the harbor is complimented by gift shops, galleries, boutiques, and speciality shops along the main street where artisans produce breads and cheeses. Farm fresh produce is also available at local farmers markets in the area. This scenic resort area features a marina, two beautiful beaches on the waterfront, parks, and four golf courses (The Alpine, Stonehedge, The Orchards, and the Horseshoe Bay), as well as a performing arts center, historic inns, hotels, and resorts. The Lautenbach and Brauer Families immigrants from Germany, arrived in Door County more than 100 years ago. Five generations of this family have been Egg Harbor Township Farmers and Homesteaders. In 1983 the Lautenbach Family expanded into Log Home Building. While working in this endeavor they harvested large 70-Foot long logs in Ellison Bay that would be great for a commercial building. In 1999 the family purchased a beautiful wooded property on Highway 42, at the 45th Parallel. The huge logs they harvested became the support beams for a meticulously detailed hand-scribed 10,000 square foot Restaurant and Lounge building which was designed and built in 2006 - and which became the Log Den Large hand hewn logs from many areas of Door County, along with massive carvings of bears, eagles, buffalo, and fish, and iron and amber chandeliers are featured throughout the Den. With seating for more than 300 people, The Log Den can host Corporate Meetings, Seminars, Parties, Weddings, Banquets, Special Events and Fireplace Dining for large groups, and intimate get-to-gethers for small groups. The BAR area has seating for more than 60 people and there are four 42” TVs above the bar, and a 62” TV in the Lounge where patrons watch their favorite sporting events. Happy Hour is popular during Green Bay Packer games. The North Woods Room 30 to 100 people, and is complete with Audio Visual Equipment with LCD Projector and Screen. The South Room is the largest area where 75 to 175 guests can be seated and adjoins a spacious Sun Room with views of the Out Door Patio and Outdoor Ceremony Space. This area also has Audio Visual Equipment with LCD Projector and Screen. The Fireplace Room is a cozy area where 15 to 40 diners can be seated around a Three-Sided Fieldstone Fireplace, and enjoy viewing a large flat screen TV. The Kitchen has state-of-the-art Commercial Equipment and Fixtures and work space design. The 40-Foot Long Out Door Patio has additional seating for many patrons. A wooded drive leads to the hand-carved masterpiece which is flanked on one side by an outdoor area for Fish Boils, and on the other side by an Outdoor Ceremony Space which features a water fountain with three waterfalls, and a beautiful Birch Arbor around which about 60 to 140 people can be seated. Over 100 Spaces provide ample parking around the building. The Log Den can accomodate any type of party or special event, and offers all the Door County favorites as well as specialty steaks, seafood, exotic food items, and special Cubbies menu for younger diners. The Log Den offers the Best Dining and Entertainment in the most beautiful Northwoods Get Away in Door County. Asking price is Million. For information please call Tim and Linda Keohane.